In 1979, Robert Christgau called A Poem Is A Naked Person an “arty horror movie of a documentary.” Twenty-five years later, his assessment holds up, although it’s likely that audiences will take the description of this long-unavailable film as an enticement rather than the moral and aesthetic condemnation that it was meant to be. Christgau’s slam came within the body of a larger piece dedicated to the films of Les Blank, then best known as a documentary chronicler of American folk music; this was before the filmmaker tagged along with Werner Herzog on the set of Fitzcarraldo and produced Burden Of Dreams—still arguably the greatest and most entertaining film about filmmaking ever made. 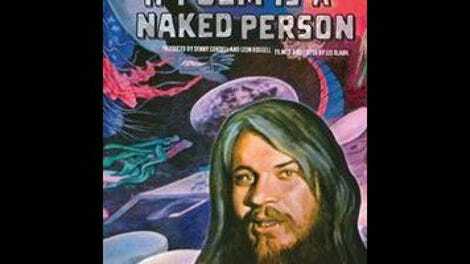 A Poem Is A Naked Person isn’t that film’s equal, although it orbits an artist who in his own way is as thorny and mercurial as Werner Herzog: Leon Russell, the Oklahoma-born singer, songwriter, and session musician who emerged in the 1970s as an unlikely music-industry titan, turning out a series of rootsy, gospel-tinged hits and even producing a few tracks for Bob Dylan. 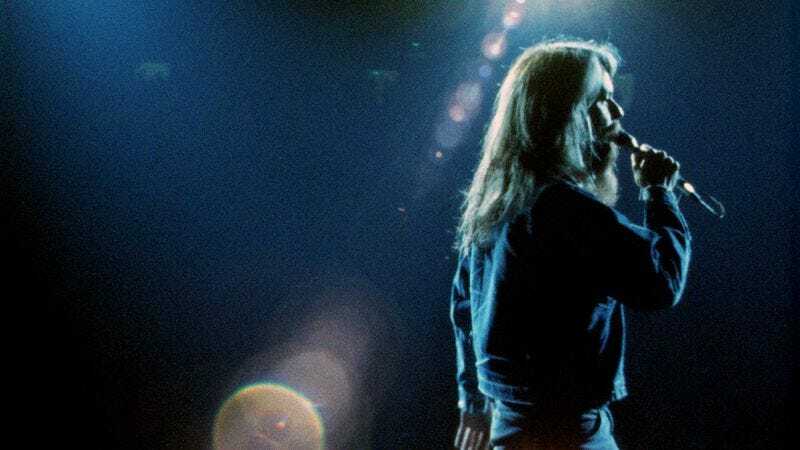 An ambitious performer who more or less willed himself to stardom in an era where folk was being outstripped by hard-rock—to some extent by fusing the older, proudly analog tradition to booming big-stadium dynamics—Russell was riding high in 1972, and invited Blank to film him at home, at work, and on tour. The shooting stretched on for two years and the film was never released, with all parties citing legal difficulties and hinting at bad blood. If Russell was expecting a hagiography, he must have been frustrated. As in Burden Of Dreams, Blank alternates between interacting with his subject and visual digressions that take in the swampy landscapes and skeezy hangers-on surrounding him, at length and from oblique angles. Sometimes Russell’s persona and Blank’s fondness for strange or transgressive images line up nicely, as when we hear the artist philosophize over footage of a snake squeezing and swallowing a baby chick (a macabre visual metaphor worthy of Herzog). Elsewhere, however, Russell becomes a peripheral figure in his own showcase. Blank’s son Harrod, who was present for the shooting and worked on the film’s re-release (he appears on camera in several sequences) has said that Russell didn’t want to be interviewed, and that his father did what he could to fill out the film—although whenever the singer is present, he doesn’t seem particularly shy about making himself heard over the din of his friends and collaborators. As a musical, the film is often thrilling. Russell’s performances are exciting—even seated at a piano, he looks like he’s about to jump out of his skin—and there are also glimpses of an impossibly young Willie Nelson and George Jones, whose singing seems comparatively effortless. Considering Blank’s background as an artist devoted to preserving traditions, it’s hard to say if A Poem Is A Naked Person is meant as a companion piece to his more modest portraits or as a contrast, and whether the director’s erratic, elliptical filmmaking choices reflect his immersion in a ramshackle milieu or a kind of nervy impatience. Either way, it’s a good thing that this unruly, enervating, sometimes exhilarating documentary finally got loose, so that more viewers can tucker themselves out try to wrestle it to the ground.